Liturgy 3.2: The use of church buildings in relation to the mission of God expressed through the Church (Discussion, based on readings from Richard Giles, Re-pitching the tent, Norwich: Canterbury Press, 3rd ed, 2004). The Diocese of Pennsylvania was established 1784, making it the second oldest Episcopal diocese in the United States and in the Episcopal Church (TEC). 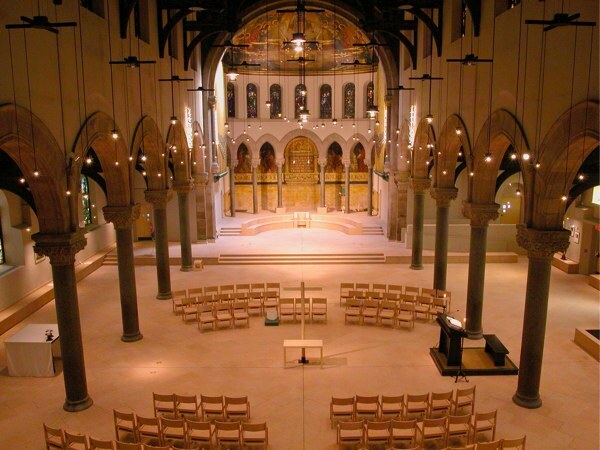 However, Philadelphia has one of the newest Episcopal cathedrals in the US. 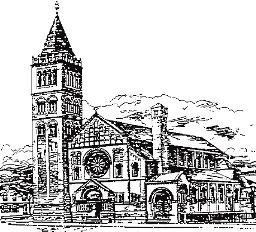 The Church of the Savior was first built in 1898 to a design in the Italianate style by Charles W. Burns, and was rebuilt in 1906 after a disastrous fire. Its crowded and ornate interior – typical of the period – survived until the 1990s, when the rigidity of its layout was recognised as a severe handicap in the building’s new role as a cathedral. During this time, the number of pews was steadily reduced to create more space. 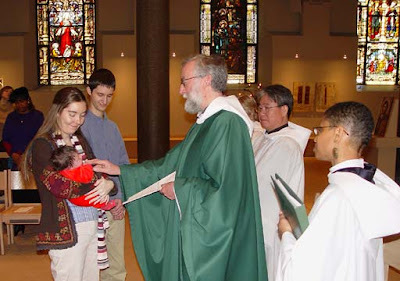 In 1992, the Diocese of Pennsylvania designated the church as its cathedral and set about reordering the ornate Italianate interior to reflect the life and theology of the people of the diocese today. 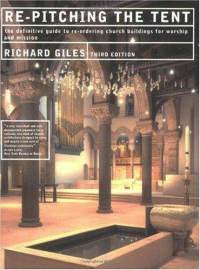 In 1999, the Very Revd Richard Giles, an Anglican priest from the Church of England with a background in town planning, and the author of Re-pitching the Tent: Re-ordering the Church Building for Mission and Worship, was appointed Dean of the Cathedral, with a mandate to completely rethink the liturgical space. Richard Giles’s vision for re-ordering churches, influenced by the Cistercians, favours a clean, austere space with architecturally strong lines. Furniture is spare and movable to allow for various seating configurations. Much thought is given to light, both the natural light available through clear windows and illumination for evening use. In contrast to Saint Gregory’s abundant, almost riotous, variety in texture, colour, and iconography, which speaks powerfully of the rich diversity of God’s creation, Richard Giles worked to achieve a single focus – one crucifix, one icon. This focus is in keeping with his insistence on one table, one ambo or reading desk, one baptismal font, and one cathedra, or bishop’s chair. He created a space that comes most fully to life only with the addition of the real church: the gathered assembly. Each component in the renovated cathedral teaches us about who we are and where we have come from in our Christian journey. 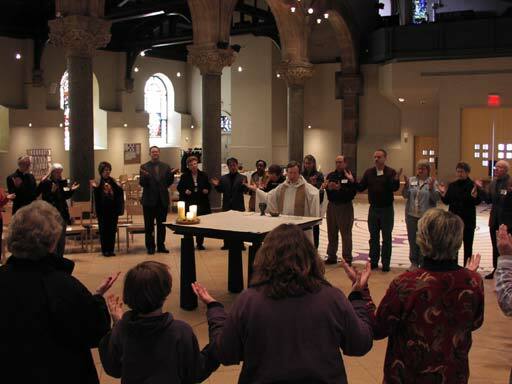 The space articulates with clarity the basic elements of Christian liturgy, giving prominence to the four basic elements – initiation, word, sacred meal, and episcopal presidency. Each of these is expressed by a single item of liturgical furniture, without duplication. The baptistery is given special prominence, as a sign of our common baptismal covenant. The cathedral is essentially an assembly hall for the baptised. The font incorporates the old font from the former Church of the Savior together with a new pool to allow baptism by immersion (rather than submersion), water flowing continually between them. In this way the fusion of the old and new, past and future, is symbolised. Around the edge are inscribed words from Revelation 22: 3: ‘The angel showed me the river of the water of life, bright as crystal, flowing from the throne of God and the lamb, through the middle of the street of the city.’ The font is a gift from the people of the Southeastern Pennsylvania Synod of the Evangelical Lutheran Church in America (ELCA), partners with the Episcopal Church since 2001 in the Call for Common Mission. The ambo is the place from which God’s word in the sacred scriptures is proclaimed. In the first Christian buildings, the ambo served as both the lectern and the pulpit, the functions of which became separated in a later era. The design is based on the bema or reading desk of the synagogue, at which Jesus himself would have read the Scriptures (Luke 4: 16-17). The altar-table is the central liturgical focus in Christian worship, for it is symbolically both a place of sacrifice (where we recall the sacrifice of Christ and offer ourselves sacrificially to God), and a place of communion (where we gather to celebrate the presence of the Risen Lord in the breaking of the bread). It is square in shape, symbolising the centring of the community, and indicative of the equal access to God’s table enjoyed by all members of the household of faithful. It is set in the midst of the assembly of faith, not set apart at the east end, to symbolise the rediscovery of the Eucharist as a participatory sacred meal, instead of a distant ritual celebrated exclusively by the ordained. It is neither fenced off by rails, nor distanced from the worshipers by steps, for it belongs to the whole people of God. It is movable, reminding us that we are a pilgrim people like our spiritual forebears the Jews who carried the ark with them, and to allow for many different configurations in the same place. Drawing on ancient tradition, the cathedra, the seat of the Bishop of Pennsylvania is not a separate chair, but set in the midst of a presbyterium or synthronos, the semi-circular stone bench on which the bishop was seated among his priests and deacons), symbolic of shared oversight. This was its place in the first Christian buildings of the fourth century. 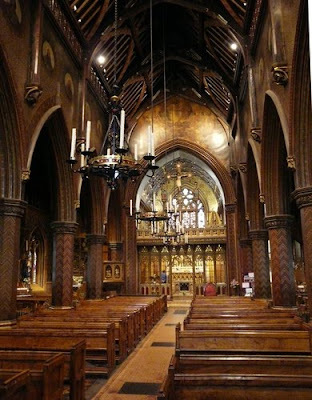 The bishop’s cathedra dominates the layout of the space, but with simple dignity rather than with ostentation. Our excerpts for this discussion are from Richard Giles’s book, ‘Re-pitching the Tent’. Richard Giles retired as Dean of Philadelphia in 2008. On his return to England, he became a Visiting Fellow of Saint John’s College, Durham. He continues to work as a consultant in liturgical design, and lives in Tynemouth. His work and his books remain influential in understanding the use of church buildings and liturgical space. 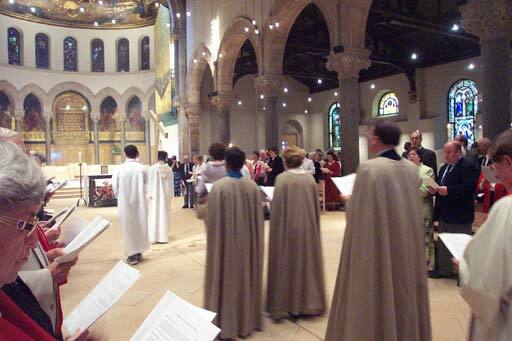 His particular expertise in the design of liturgical space bore fruit in the publication of Re-Pitching the Tent, now in its third edition, Creating Uncommon Worship (2004) and Times and Seasons (2008). His other works include Mark My Word, daily meditations on Saint Mark’s Gospel, How to be an Anglican, a light-hearted introduction to Anglican belief and practice, and Here I Am, reflections on the ordained life, all published by Canterbury Press. In Re-Pitching the Tent, Richard Giles says that when it comes to the environment of worship, we should never underestimate the influence of our building upon the way we think about God, about each other, and about the relative importance of the activity we have come together to engage in. Our buildings need to speak clearly to us of what we are about as the people of God. Throughout Christian history, every fresh insight into the nature and love of God, every reform or revival, has been worked out in bricks and mortar as well as in tracts and texts. The re-ordering of the church building can be the catalyst by which a parish community is recalled to the pilgrim path, to the adventure of going with Jesus into the unknown, to essential Christianity. 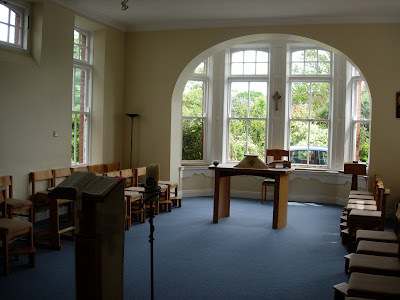 … Like the house-churches of the early centuries, our buildings should provide us houses which can become homes for the Christian assembly, showing us how to be fully human in order that we may become more fully church. At the heart of Christian worship lies the mystery of the transformation of the people of God themselves into temples of the Holy Spirit, and the task of transferring this truth to the drawing board is not an easy one. The people who stay outside our buildings vastly outnumber those who venture inside. … For those outside, our ecclesiastical world remains alien territory requiring considerable effort and courage to penetrate. Our task as Christians with a welcome to give and a story to tell is to remove one by one every obstacle which might just conceivably deter anyone from taking a closer look at who we are and what we are doing. We are above all designing for mystery, for something beyond that which we can contrive or control. Movement both recalls us to our nomadic roots as God’s journeying people and helps us in a practical way to involve all those present at worship to participate in the liturgical action … Movement is the hallmark of a community which knows it has not arrived, but is in transit, discovering God not at the end of the journey but in the journeying. We move because we must. We are beings-in-relationship rather than creatures in ourselves, and our buildings should demonstrate the corporate nature of our worship.